As a RoATP* main provider as well as a CIPD approved centre, Watson Martin is uniquely placed to work with large companies to deliver a complete end-to-end HR Apprenticeship package. In addition, Watson Martin can work in partnership with other RoATP training providers to deliver the CIPD qualifications associated with an HR Apprenticeship scheme. “We are already specialists at delivering high quality HR and L&D qualification programmes and so it makes sense for us to use this knowledge and experience to help large organisations to develop their Apprenticeship schemes,” explained Watson Martin’s Director, Heather Watson who is leading on the new programmes with Apprenticeship expert, Sharon White. “Apprenticeships are a great fit for us as our whole approach to learning allows candidates to use practical experiences in the workplace as part of their assessment process. We are very excited about this opportunity which takes us to a whole new level as a qualifications provider,” she said. Apprenticeships provide employers with a cost-effective way of growing their skills base. Open to all ages from 16, they combine on the job training with studying for a qualification. For young people, Apprenticeships offer an excellent alternative to university where they can achieve the same level of qualification alongside the work experience to help them get a job, and all without incurring the debt associated with full time higher education. All Watson Martin Apprenticeship schemes are flexible and tailored to the needs of the collaborating organisation or training partner. Working with cohorts of a minimum of ten people, the company delivers to the full Apprenticeship Levels 3 and 5 standards not only to provide CIPD qualifications but also meeting the 20% off the job learning provision, functional skills, end point assessment (EPA) preparation, as well as all of the government requirements in terms of monitoring and reporting. Apprentices will benefit from the best industry tutors, a planned programme of workshops, 24/7 access to the company’s Virtual Learning Environment (VLE) and other quality forum and online materials, one-to-one meetings, a dedicated account manager and rigorous monitoring from start to finish. In addition, they will be able to upload their assignments and evidence straight on to an ePortfolio where their assessor can access it and provide their feedback. Watson Martin is a leading provider of CIPD HR and L&D training. The company delivers the full range of CIPD programmes at all levels along with the widest choice of optional units of any centre. 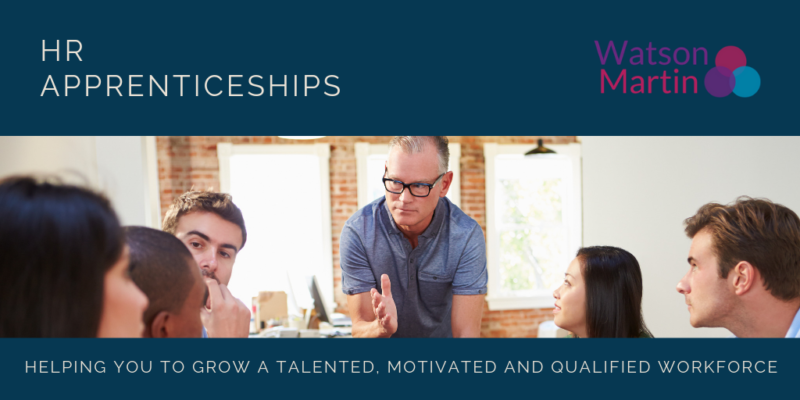 For more information about Watson Martin’s Apprenticeships offering or any of our programmes and qualifications please call our advisers on 020 7932 2760 or click here for more information.